On Saturday, May 17, 2014 Eat|See|Hear will show the 1999 film Office Space in Santa Monica at Santa Monica High School. The event will also include LA food trucks and a performance by a local band. This is a great date night idea for couples to enjoy a great movie, good food and live music on a budget and enjoy the spring weather. Eat|See|Hear, an event series screening outdoor movies in LA, announces the second movie showing this season. 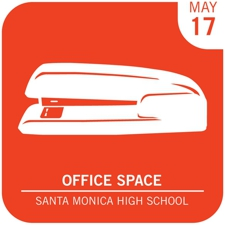 Eat|See|Hear will show Office Space on Saturday, May 17 in the Memorial Greek Amphitheatre at Santa Monica High School. The event begins at 5:30 p.m. Live music will begin at 7:30 p.m. and the movie will begin at 8:30 p.m. The high school is located at 601 Pico Boulevard in Santa Monica, CA with the event entrance on 4th Street. There are several accessible parking options available. Attendees may park across the street in the Civic Center parking structure at 333 Civic Center Dr. Limited on-street parking is also available as well as bike parking for those arriving on two wheels. The location is dog-friendly and attendees are encouraged to bring their four-legged friends who will receive a complimentary dog biscuit at the door. Office Space is an American comedy released in 1999. Directed by Mike Judge and starring Jennifer Anniston and Ron Livingston, the film follows a group of disgruntled office employees and has spawned a memorable internet meme of Gary Cole’s character Bill Lumbergh. The film is rated R and has a running time of 89 minutes. The event on May 17 will include a performance before the film by local LA band The End of Summer. LA food trucks including MOE Eggrolls, White Rabbit, Good Greek Grub, Fuego Fusion Tacos, Coolhaus and Brasil Kiss will also be on site providing dinner, desserts and everything in between for event goers.